Thanks to a close relation with the Asturian Celtic League, they offered me to publish an essay I wrote in 1986 about Faerie, called “Correspondences between Galician and Asturian Legends – Comparative study between celtic motifs.” The book was issued in asturian language (‘bable’) in 1988 with the support of the Principate of Asturias. In 1989 I met Fernando Lynch, an irish descendant who by those days carried along a duet with a non-celtic fiddler called ‘Gwyn’. After the break of ‘Poitín’, we sessioned together and considereded then the chance to line-up ‘Lenda Gwyn’ (Lenda: galician for ‘legend’/ Gwyn: welsh for ‘white or pure’, also related to the deity). With few shows, the band disolved in 1991, but my musical link with Lynch remained. Since the harp was rather difficult to carry along without a car, I started to consider the need of adcquiring a model more suitable for trips. By those days I’d made contact with Elizabeth Clark, dulcimer player and partner of the ex-’Mooncoin’ Micky Zeckley, at Lark in the Morning, California. With her advice I ordered a lap harp kit which I-later assembled with the help of Ruben Uballes in February ‘92, it carries along 22 strings with no sharp lever. It’s shape and tone pleased me quite a lot to gain the road, though I allways had trouble with the soundboard which bends under pressure. After almost ten years of looking out I came across Alberto Ortega, the only paraguayan harpist, who besides teaching and playing, repairs and makes native harps. With Lark’s model in hand we´ve deviced on March ‘97 a new design of lap harp on cedar wood and pine soundboard, which proved to sound and looks pretty good!. A sort of travelling harp on G we´ve called ‘Bardic Rover’. Throughout 1992 and first half of 1993 I joined with Manuel Castro in the purpose to work on a book called:“Celtic Legacy”, which we finally issued in 1993 in Buenos Aires, Argentina as a galician/spanish edition. Compiles selected poems written on contemporary bardic styles by myself and Manuel. It is not intended to be a recopilation of works written in youth, but an invitation to discover a common tradition, an identity still alive that cannot be distant to those who inherit a celtic legacy. 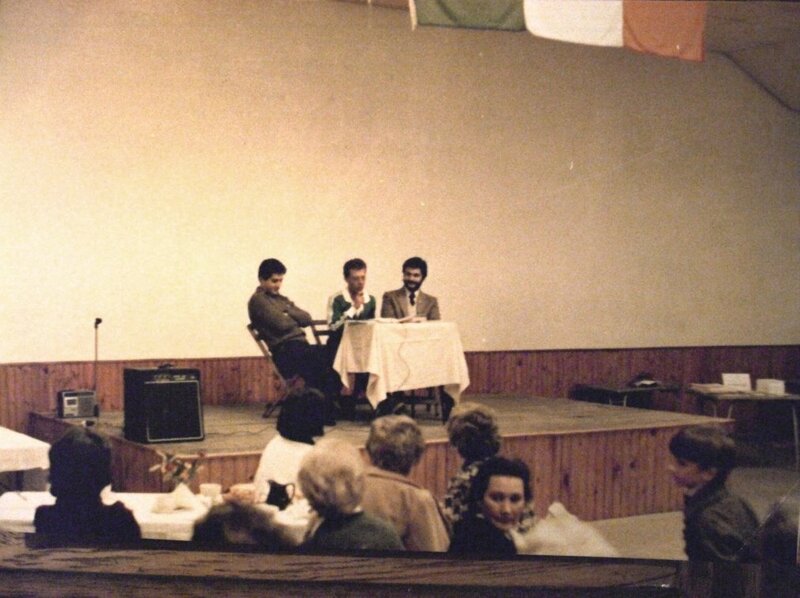 We promoted the book with great success through shows consisting of recitation of some poems accompanied mostly with harp and few with whistles, featuring contemporary celtic tunes of my own and traditional arranged. A few months later during Samain, I found myself at Lynch’s home sessioning and making plans for a new band.Due to the engrave of an oak tree displayed on a pseudo-celtic card oracle, we decided it was time for ‘Duir’ to sound along, reaching out this time expectant non-celtic audiences unaware of this ancient lore. Tunes traditional and of our own; songs sung in english, gaelic, breton, galician, and asturian have been delighting listeners all around since then, allowing us the opportunity to gain more acceptance for our music within other cultural circles. It´s necessary to comment at this point, that technical advances on digital recording in the ‘90s enabled bands all over the world to show their folk music, and opened a new market to labels. As what to the celts concern, many titles were reissued rendering to listeners the chance to adcquire old classics, out of order, and new tracks with the enhanced quality of Cd´s digital sound. On 1994 I-met Andres Valle, a lad with no celtic roots, but keen to folk bands like Clannad and Capercaille, and countries like Ireland. In fact, I-knew him after his recent trip to Eire where he acquainted with the O’Brennans at Donegal and Capercaille at Dublin. Since he is owner of a Compact Disc’s Shop, we started to work together for the spread not only of celtic music but reviews on it too. On Dec’94 was issued the first number of ‘Discover’, the institutional magazine for which I’ve been writing since then.On Nov’95 The Royal Celtic Galician Association was disolved and Manuel Castro left Duir to found the Celtic League of Argentina, re-launching ‘Poitín’ with an ex-member under the name of ‘Potim’,actually an epical new age less folk version of the anthological band. The band finally dissolved on 1988. Beside my everlasting shows with Duir, I intended to line-up a Celtic Progressive band named ‘Dagda’,conceived rather as a creative cross-polination than a folk-rock based band.Due to lack of time and keen musicians, I started with a solo project which gave birth to a new band, lined up with musicians who seldom joined DUIR over the years. On Samain ‘97 I left DUIR to line up BRAN, my present band, whirling around the recording of a CD issued on August ‘98 under the name of ‘Awen’, which has come an exciting experience since then. By the year 2006 I met Gabriel Bollani, a renowned percussionist in my neighborhood, with whom I began to record a new project as a duo, basically based on virtual experiments mingled with acoustic sets which recreates irish and scottish songs of love, dreaming and desire. Presently we have pre-recorded 13 tracks still unrealeased. Only the 1st cut has been issued through the Mellotron Magazine Sampler in Dec 2006. It’s rather difficult to resume deeds and events spaned over the last eighteen years. Many accounts have not been quoted, but it’s lovely to know that each day there is more worldwide acceptance for anything relative to celts, and in Argentina young people are more fond of this music. Presently I still carry on the pressure of being the only folk harpist. Maybe I’m lucky not to be compared with, or maybe it implies more responsability and dedication in order to be true with this art. Anyway, as the bards will relate, I’ll keep my own pace till the last stroll, and wear the butter-coloured socks the wee folk gave to me, weaving tunes unto Faerie and the moon, and at noon,… walk back on them!. By the year 1986, as a member of the Celtic League -International Branch, began to struggle for the recognition of Galicia and Asturias as Nations Members of the Celtic League, who conceived the possesion of a ‘celtic language’ as ‘the principal’ element of our celtic nationality. We worked at our Association enlisting signatures in favour amongst our local centers, joined by the Celtic Leagues at Galicia and Asturias. We conceived ‘ language’ as a vehicle, one of the means for retelling lore from one generation to another, but not a sheer value to enable ourselves to label a celtic heritage!. Hadn´t people such as Irish, Scottish, Cornish, Manx, been obliged to learn english in order to emigrate or be employed by english people?. Didn’t welsh suffer the Welsh Not english penal laws even at school?. I accept english language as a commercial language between bilingual cultures, moreover as an international mean of communication -in fact I’m now getting contact with you through english and this doesn’t makes worthless our celtic experience. If we play the role of purists, we should label those so called ‘celtic bands’, less folk for their lyrics in english language…. the role of writing and speaking in celtic dialects (gaelic/britonic) won’t carry us onto Celtia… maybe it’s more important to know what feels like ‘being’ celt, now that some of us cannot ‘co-exist’ with his own celtic language. In the latter half of 1985. I met Manuel Castro, a son of galician inmigrants who by those days had return to Argentina from a long residence at his parents native town. With him we agreed to establish an association of young people who should really care for their celtic heritage, and felt free to grow within it. 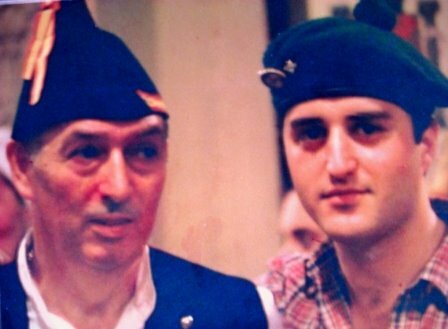 Thus in January ‘86 we lined-up the Royal Celtic Association of Galician Pipers, whose goal was to revitalize and study our culture, have a folk group (afterwards called ‘Poitín’), and a Piping Band with pipes designed on our own, based in the traditional galician bagpipes but suitable for parade. By those days, there was only one pipe-designer alive, he was galician and from his crafty hands and woods made only two sets for us. Unluckily he died afterwards, but this galician bagpipe design was later adopted by the Royal Piping Band of Ourense in Galicia in the ‘90s. 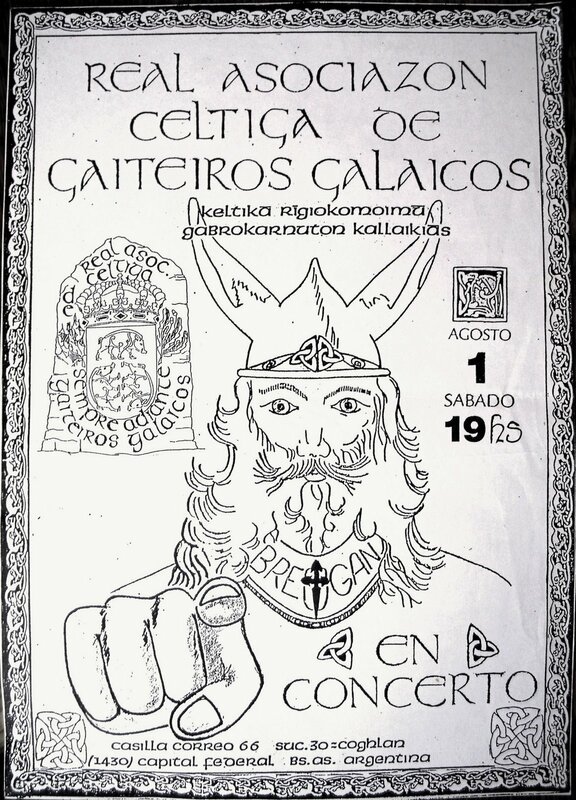 Thus we changed our name in 1991 for Royal Galician Celtic Association, now open to any celt descendant with purposes of studying our common lore, held lectures, publish articles, and of course, promote folk music. In 1987 we started at the Royal Celtic Association to line-up it’s folk band ‘Poitín’ (gaelic for the reknown irish ilegal whiskey), we did some shows live and for TV, a southern gig among welsh communities in Patagonia, and finally recorded a tape in 1989 , which actually is the first recording ever made in Argentina of celtic music, songs and poems, traditional and of our own in galician language. Due to changes of attitudes and feelings towards it’s music the band splited in 1990. Just in 1982 I came across an album which influenced me a lot because of it´s performer and the instrument performed, I’m refering to ‘Reflets’ by Alan Stivell, and a few months later got the chance to purchase Clannad’s 2nd album…suddenly I-began to yearn for a harp. As I’ve already mentioned, it was hard to find by those days in Argentina, recordings of celtic music.I received much help from the people at Elderly Instruments at Chicago; and from Wendy Newton,founder of the nowadays succesfull label Green Linnet, who gave me the chance to get music and even books on celtic culture.Thanks to Robin and Janet Williamson I established contact with Sylvia Woods (ex-Merry Band harpist) with whom a gentle and richfull info-exchange grows since then. I-recall how anxiously awaited the albums and catalogues on harp I ordered from her own and of Clannad, Stivell, Ball, etc; on behalf of Sylvia contacted another ex-Merry Band: Chris Caswell, and his lovely partner of duet: Danny Carnahan. When I-received the photographs of the harps that Chris made, my desire grew higher… in spite of my lack of money. A kindle sparked within my wondering corky head: why not consider the chance of crafting a celtic harp in Argentina?. I got the chance to meet a harp maker called Ruiz Diaz (he was skilled on crafting the wood, he knew Alfredo Ortiz, but his harps were not secure and either way, were Paraguayan styled) who didn´t accept my offer since he knew nothing of celtic measures. Then I looked forward to Ruben Uballes, who is the only luthier of Pedal Harps down here, he has also developed a model that mingles the mechanic of levers, and the style and tone of the Paraguayan non-pedal harp. Instantly my dreams came true, since he recalled a man who owned a non-pedal harp at the sight of those lovely celtic harps pictured on catalogues. We then began to search for his address, and found he lived 289 miles away… as you may gather, no distance would apart me from her. By a phone call to the owner, I-acknowledged he purchased the harp for his daughter, who wasn´t presently performing on it, and as he was eager for money we sealed the purchase. It is a folk harp with much of celtic patterns in style, it is made by Salvi, a Renaissance model, originally bought at the International Harp Corp. in California by the year 1980. Range: 34 strings; standing height: 49 inches; Max.Width of soundboard: 13 inches; base with optional three legs; built on maple and spruce. I-carried along the harp back home just one day after 1985 Christmas Eve, maybe one of Santa´s considered deliveries… Relatives said I looked strange by those days, with no chance to get asleep nor eat; in fact, I-never imagined I should play harp alone and that was what I-did!. By those days grew up my interest on celtic history and literature, but found few traditional activities within communities in Argentina, except an independent group of irish girls called ‘Celtic Argentina’ who danced tape-wired jigs under the direction of a local teacher. What to the Scots refer, they held three Piping Bands and Dancing Corps, they’ve allways loved what they do, but found few who considered themselves as celts, nevertheless, they did preserve some ‘sense of belonging’ to Alba and held activities (not the case of the irish, who had no uillean piper performing among them; maybe that’s why we can still find irish pipers and dancers as members of scottish centers). Welsh people are almost settled down in the Patagonia -Southern Argentina-.Cities like Trelew, Gaiman, Trevelin are crowded with descendants since 1834. Luckily they preserved their language and tradition -specially those lovely puddings!..gee…. They have no harp players (neither the irish or the scottish have) but do preserve an unstrunged tripple harp at a musem in Gaiman and they love choruses. On each Eistedffod some nice songs in welsh can be heard in Trelew. Galician and Asturians people came from Spain, and have many descendants in Argentina. My roots are galician based, and many Bands of Dancers and Pipers from Galician Centers are often to be heard performing, they also have lectures, teaching of the ‘galego’ language (romanic language with over 100 words in ancient celt) As for the Asturians, they held only two Bands of Dancers and Pipers. Either way these people are conscious of their celtic heritage and teach youth followers. These brief aspects of communities above related hadn’t changed too much since my first contact in 1984. Maybe this fact accords to a theory of my own, which considers two kinds of emigration. The emigration with hate, that tries to forget its terrific past; and the other, the emigration with sorrow, which tries to settle down in foreign lands an extent of a beloved culture they’ll never forget. We should also consider at this point, that none is a prophet within his own circles, and some celts are reluctant to accept thoughts or even teachings given by celts who belong to a different branch (e.g. : irish/galician). Anyway, due to the upcoming of Celtic Festivals in the 90’s many young celtic music fans began to line up some folk based bands, some with celtic blood on their veins, others just keen to music.Long ago remained my days of pen paling and ordering vinyl records from abroad…internet widespreaded and the chance to be approached to celtic culture rose. Somehow I felt that my humble seed had grown up interest at local circuits.